This past weekend, it was a winter wonderland in Atlanta. Real snowflakes actually accumulated. Naturally, everything else came to a grinding halt. For a potluck, I made a Thai Green Curry Chicken dish from a recipe I picked up in Bangkok. The ingredients were a little harder to find, but I located small green Thai eggplants at the Dekalb Farmer's Market. Those Thai red and green peppers really pack a punch. 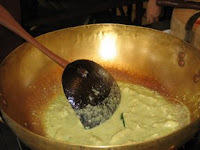 Most Thai dishes use fish oil instead of soy sauce or salt. The dish turned out well, but a little spicy for my palate. Also, I'd like to welcome the F&F baby brigade of 2008 in order of birth: Noah (New Year's baby), Maia (pictured, the jewel of the family), Jackson (early bird baby), and Isan (adorable). All cute as can be. Can't wait to meet 'em.